Ben Hogan is one of the giants of golf history, a steely perfectionist on the course whose career included a remarkable comeback from a horrific auto accident. Ben Hogan: "I hate a hook. It nauseates me. I could vomit when I see one. It's like a rattlesnake in your pocket." Ben Hogan: "I play with friends, but we don't play friendly games." Dave Marr: "Hogan plays one game and the rest of us play another." Ben Hogan's first PGA Tour event was the 1932 Los Angeles Open. He finished tied for 13th place, earning a $50 paycheck. 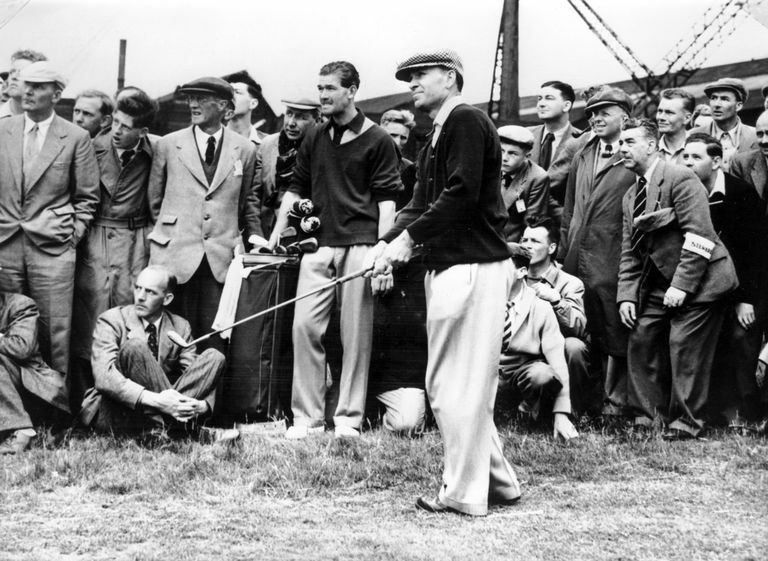 Hogan won 30 tournaments before winning his first major (1946 PGA Championship). That's the record for most wins prior to a first major. Three locations in the golf world are nicknamed Hogan's Alley because of Hogan's success there. The PGA Tour's developmental tour, later called the Nationwide Tour and Web.com Tour, was originally named the Ben Hogan Tour when it was founded in 1990. There are two Ben Hogan Awards in golf. 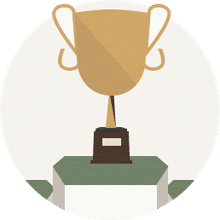 One is presented to the male college golfer of the year; another is presented to a golfer who overcomes injury or handicap to remain active in golf. A common golf betting game called Hogies is named after Hogan. It involves hitting the fairway, the green, and 2-putting for par. In 292 career PGA Tour events, Ben Hogan finished in the Top 3 in 47.6-percent of them. He finished in the Top 10 in 241 of those 292 events. Hogan was born near Fort Worth in 1912. Hogan and Byron Nelson were childhood acquaintances, caddying at the same Fort Worth club. They even squared off one year for the club's caddie championship (Nelson won). Hogan's childhood was rough - his father committed suicide, and it is believed that Hogan witnessed the tragic event. Hogan turned pro in 1929, at age 17, to play pro events in Texas. He didn't join the PGA Tour until 1932. Much of his early career, Hogan battled a hook. But through a tremendous work ethic, he changed his game to a controlled fade (in his famous words, he "dug it out of the dirt"). In 1940, he began winning, and often. He missed a couple years on Tour due to World War II, but returned full-time in 1946 and won 13 times, including his first major, the 1946 PGA Championship. From August 1945 to February 1949, Hogan won 37 times. But in 1949, he suffered terrible injuries in a car crash, and was never again able to play a full schedule due to circulatory problems in his legs. Sixteen months after that crash - in which Hogan threw himself across his wife to protect her as their car collided with a bus - Hogan returned to win the 1950 U.S. Open. That victory is sometimes referred to as "the miracle at Merion," because Hogan won despite severe pain and having to play 36 holes on the final day. In fact, from 1950 on, Hogan never played more than seven PGA Tour events in a year. Yet, he won 13 more times, including six majors. Until Tiger Woods did it in 2000, Hogan was the only man to win three professional majors in one year. That was in 1953, when Hogan won the Masters, U.S. Open and British Open. (He didn't play the PGA Championship because that tournament's dates conflicted with the British Open's.) From 1946 to 1953, Hogan won nine of the 16 majors he played. Hogan brought his same quest for perfection to the golf clubs made by the company that bore his name, and Ben Hogan Golf produced many of the finest clubs available over the years. His demeanor on the course was quiet and focused. With others, Hogan was often distant and aloof. But he had everyone's respect. Ben Hogan was inducted into the World Golf Hall of Fame in 1974 as part of the inaugural class. Ben Hogan wrote or co-authored two golf instructional books. The first one listed here is still considered a must-read by other golf instructors today. Hogan won 64 tournaments that today are credited as PGA Tour wins, with nine majors among them. His first PGA Tour victory happened in 1938, and his last was in 1959. Hogan achieved those 64 wins despite his career being interrupted by World War II and by an automobile accident.